3.0 Unported (CC BY 3.0) licence from UK ParliamentDamian Collins MP. A British MP savaged Twitter over its response to questions about Russian meddling in Brexit. 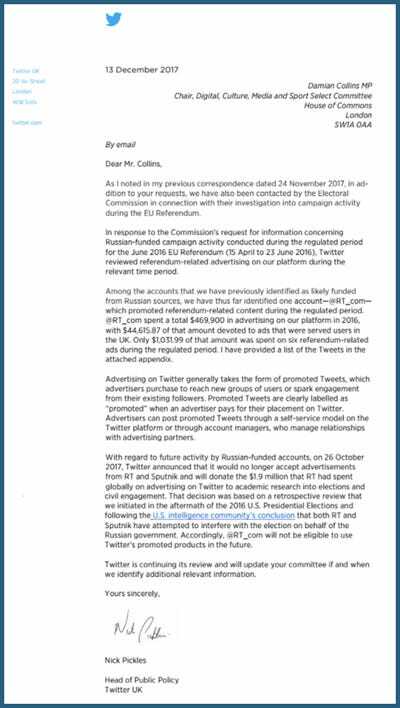 Twitter said only one Russian account spent money on EU referendum-related posts on the platform last year. It follows reports that thousands of Russian-linked Twitter bots tweeted about the referendum in the days leading up to June 2016 the vote. An influential British MP has slammed Twitter for its “completely inadequate” response to questions about Russian meddling in the EU referendum last year. 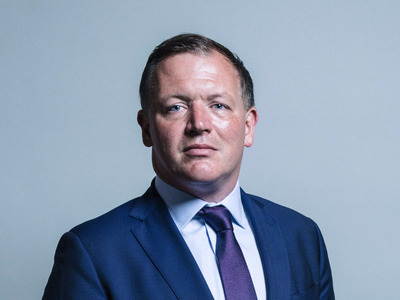 Damian Collins, chair of the UK’s Digital, Culture, Media, and Sport Select Committee (DCMSC), is leading an inquiry into fake news and has called on Twitter, Facebook, and Google to disclose the activity of Russian actors on their platforms during Brexit. Twitter responded to Collins, a Conservative MP, on Wednesday, revealing that it had so far identified @RT_com – run by Kremlin-funded broadcaster RT – as the only account “which promoted referendum-related content” in the three months up to the Brexit vote. It said RT spent $US1,031.99 (£768) on six referendum-related Twitter ads during that period, all promoting the broadcaster’s coverage of the vote, which took place in June last year. Twitter also shared this information with the Electoral Commission, which is investigating the issue in parallel with the DCMSC. But Collins was not satisfied by the reply, given the evidence of systematic Russian interference on Twitter. A number of British academics have found that thousands of Russian-linked Twitter bots tweeted about the referendum in the days leading up to the vote. “It seems odd that so far we have received more information about activities that have taken place on your platform from journalists and academics than from you. Collins expects a response from Twitter by mid-January next year. 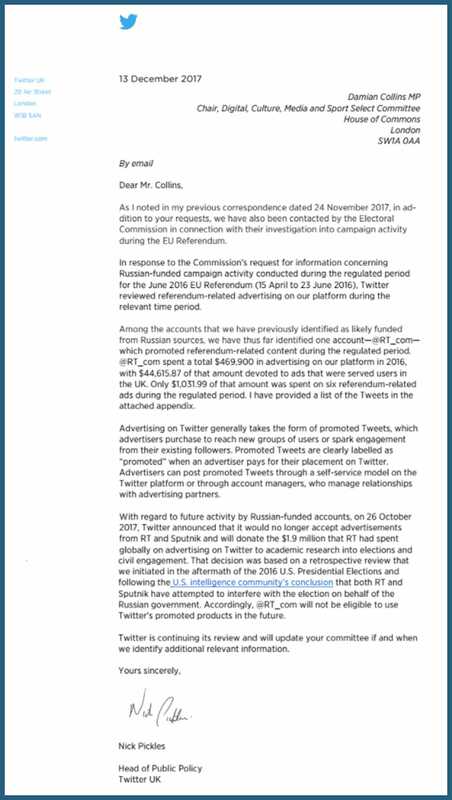 Collins’ letter to Twitter comes one day after Facebook told the UK’s Electoral Commission that a Russian-backed agency spent $US1 (75p) on ads that were seen by 200 people in Britain at most. Collins accused Facebook of doing “no work” to look for Russian activity in the Brexit vote beyond that of the Internet Research Agency, which had already been active in the US presidential election.